Below is the detailed comparison between DoPrep’s BITSAT Study Guide and Arihant’s BITSAT Prep Guide conducted by Anjali Arora (Undergraduate student at Birla Institute of Technology and Science, Pilani (Goa Campus)). Both the books are good enough for BITSAT but there is always one which stands out more than the other one. This analysis doesn’t give a clear-cut verdict as to which one is the best one but surely highlights the points which are in favour of both the books and these will help you make the choice which will be best suited for you. Making choices on your own during JEE or BITSAT preparation is the best so that you don’t regret or blame other later on! Starting from the cover page itself, the DoPrep has outlined its detailed inclusions right on the cover page so that the aspirant instantly knows all that he is going to get with the book. Whereas the Arihant test guide gives just a couple of generic lines describing the inclusions of their book. The DoPrep guide contains a well-written preface which clearly explains the purpose and motive of the book and briefly motivate students too for the exam. The book has various pages dedicated to explaining preparation strategies, do’s and don’ts and how to’s of the BITSAT exam in the beginning. The Arihant book directly cuts to the index followed by the syllabus and then the contents of the book. The book’s initial part has just one good thing which is the syllabus of the exam and this part if added to the DoPrep study guide would really help. The DoPrep guide has broken down the syllabus into topics exactly as mentioned in the BITSAT syllabus and each chapter contains all that is laid down under the respective chapters of the syllabus on the official site of BITSAT. The first page of each chapter outlines the contents of the lesson in detail. However, the Arihant book goes on to divide the syllabus into several small topics and not entire chapters. This could be helpful in some ways as you know exactly which page to turn to for a chapter or topic in many cases. This point is just an added one as it doesn’t really help in deciding which book is the better one out of the two. The DoPrep test guide stands out a lot in terms of its theory quality. The theory is given in such a way that it isn’t too elaborate and also not too concise. 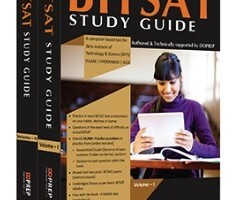 The theory is apt for BITSAT, there are definitions, their explanations followed by solved examples, illustrations and any possible exceptions make it a pretty good source for revision and preparation before the exam. The Arihant test guide has really concise theory which just consists of very short definitions which might not be too useful for someone who just has basic knowledge and looking for proper review material. Thus, it might not be too useful for most of the students. The chemistry and physics theory is specially really nicely given in the DoPrep BITSAT guide. Both the books are decent in terms of the question quality. However, the DoPrep test guide is great for physics as it has really logical questions which are very much like the actual BITSAT. The chemistry section too is good but a greater number of questions in the level 3 section would really add a lot of value to the book. Mathematics section could be a bit better in the test guide as it is slightly more inclined to JEE Main than BITSAT and here too, if the level 3 questions are increased in number, it would be of great help. The Arihant test guide is slightly on the tougher side when it comes to Physics and not very much like the actual BITSAT. Chemistry is comparable to BITSAT but questions could be more so that practice could be done in a better and more complete way. The mathematics section of Arihant test guide is good and with a little a greater number of questions it could really be of great help. Apart from the above major points, Arihant has a really concise section on English and logical reasoning which is difficult to locate on the index too. Much attention has been given by the DoPrep guide to these too. Overall, both the books are decent and the DoPrep test guide stands out more for me somewhat due to its theory and a good dedicated section for logical reasoning and English. The online section and the app built by DoPrep for practice is also commendable. The Arihant guide however, doesn’t offer much on the online front. The DoPrep guide, if done thoroughly should surely fetch you a really good score in BITSAT. Make a wise choice after reading the above!